The Elantra is a fine vehicle that can be made to handle well for it's class. So why not test those new found abilities in a safe and controlled environment? 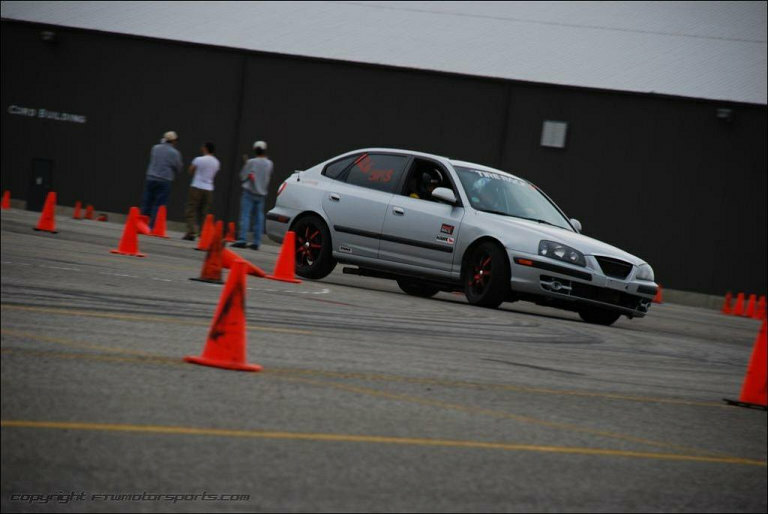 SCCA Solo Auto-x has many classes to fit as many cars as possible. The most common classes that our cars will fit into will be HS (H-stock), ST (Street Touring) and SM (Street Modified). Each class has it's own rules and regulations to even out the class. Here's how the Elantra fits into each. HS is the bottom rung Stock class we fit into. This class is meant to keep the car as close to factory as possible. We can change the struts, and remove the exhaust past the second cat. No changes to springs, sway bars, no additional strut bars and no intake changes are allowed. The big exception is the allowance for R-Compound tires. But with our camber challenged cars and their soft suspension this is not a very competitive class for the car. BEing 2900lbs empty plus driver and a modest 138hp makes it oversized, undersprung and underpowered. ST is the next progressive step up. It requires the use of 140 treadwear tires and up, but allows a plethora of common changes that favor the ELantra. Sway bars, struts, springs, exhaust, intake are all allowed along with the use of wheels up to 7.5" wide and a 225 width tire. THe Elantra, being as large and heavy as it is can really take advantage of the wider tires. Toyo, Hankook and Kumho are all offering 225 width tires in 15 and 16" sizes to complement the added suspension upgrades. ST is dominated by 1989-91 EF Civics because the rules/allowances really compliment that car. The Elantra will never win against them. Hate to sound harsh, but it's fact. We have almost a thousand pounds of weight and a less complete suspension package to really compete and make about as much hp at the wheels as they do. What we do have is torque. 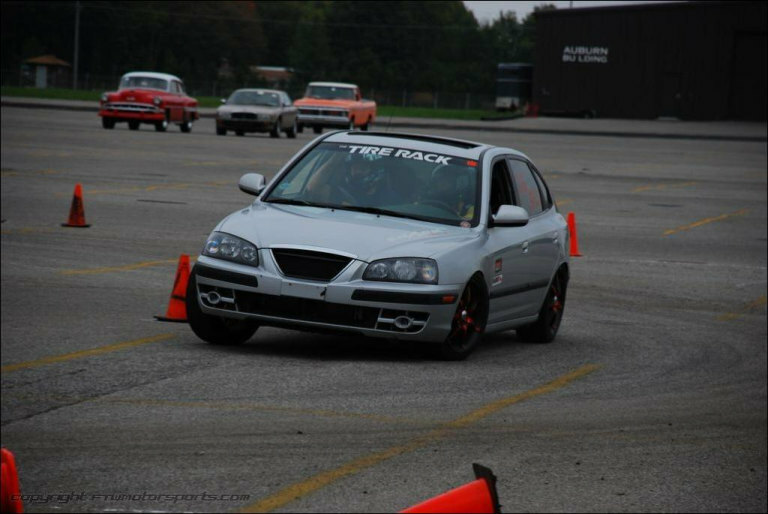 Most 45-60 second auto-x courses allow us to shift to second gear and leave it there through the end. SM is where we go with turbos, headers (eleminates teh cat, automatic boot from ST), unlimited engine tuning, engine swaps. IT allows almost all modifications to the suspension setup, brake upgrades and allows the addition of an LSD. This class is currently dominated by EVO IX's and their all wheel drive and tremendous power makes them a tremendous car to beat. We're outclassed here. In a big way. But don't let that discourage you. Most local classes that put people into a SM category have very few people that are fast or experienced. It's quite easy to manuever yourself into a trophyspot in the local classes. Auto-X is more of a social event than racing. People come to watch, and partake in the festivities and there are many MANY experienced people willing to help that new person get started. While it's a great way to test your car at it's limits with the least amount of risk involved, it's also a great way to meet more gearheads like youself. Be sure to get there early, ask lots of questions and bring plenty of sunscreen! The Elantra can be a very regionally competitive and fun daily driver. First step: Get a Tib 19mm rear sway bar. If you haven't, you'll know why you need one when you look at the post race videos/pictures. A good set of performance springs, aka Eibach or H&R's make good DD and auto-x springs and while you're there, get a set of KYB Tib struts. The Tib struts offer better dampening in the rear and will help the car settle down in rougher sections. This combo offers a lot of grip, but is very forgiving to a new driver. Coilovers, from H&R and K-sport are also upgrades over stock, but require more precision on course, more maintenance to keep them working properly and take a lot of the comfort out of DD'ing. NExt step is whee;s/tires. There are many ways to go. Lots of good performance oriented tires out there. 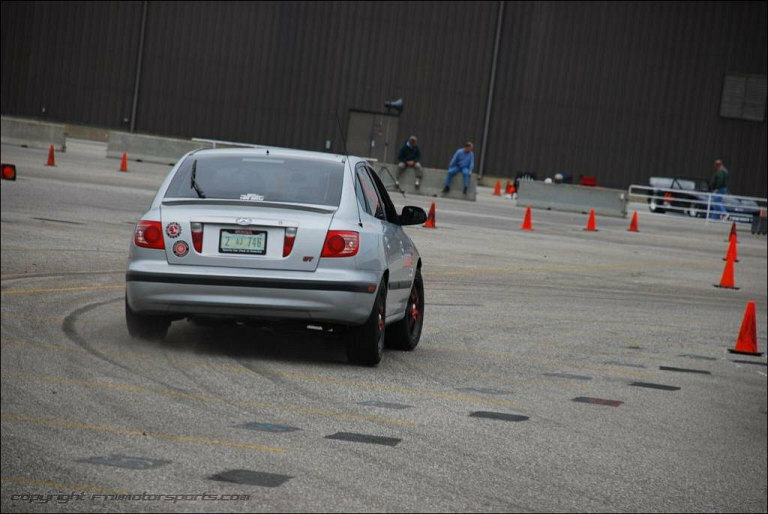 But the Elantra is a large and heavy car and will remind you of that the first 5 cone slalom you hit. Stuff as much tire as you can under those fenderwells. 225 width tires are a class limit but are a good choice to the ELantra. Be sure to mouint them on a minimum of a 7" wide wheel. A good combo to keep factory gearing close is a 16x7 +40 offset wheel and the 225/45/16 Hankook RS-2. The tire is rated for extra load capacity and works very well in a car like the Elantra. Alignment is important as well. With the MAcphearson struit suspension, negative camber is in short supply. A set of camber bolts should get you to about -1.5 to -2* of negative camber up front, and the rear should be able to reach -.75*. Toe in the front would be best kep at 0 for a DD car, or could be bumped up to 1/4" toe out for a track oriented car. REmember, toe wears tires, so running toe out on your DD will wear tires much faster. Since ST does not allow removal of the primary cat or or we allowed to move it more than 6" from it's original location, a header is not an option. CAI (for the cooler air and better low-midrange torque) is a great investment, as well as a cat-back exhaust. Don't go too big on the exhaust or you will lose some low end torque. That torque is the one advantage we have in this class, so try to keep it and use it as much as possible.